Steak, potatoes, broccoli, bell peppers and onion brushed with olive oil, garlic and herbs and oven roasted for 10 minutes until tender! Growing up, we’ve always cooked steak on the stove-top in a skillet. Because we were a large family, my dad would have to cook at least 4-5 batches of steak and it was time-consuming. This sheet pan method makes cooking steak so much easier and quicker. You can cook the steak and all your favorite veggies in one pan. I used broccoli, red peppers, onion, and par-boiled potatoes. Now do keep in mind that since potatoes take a very long time to cook, you will need to boil them in water for 10-12 minutes to soften them up. We don’t use the oven itself to cook the steak but the broiler as the primary heat source. Think of it as grilling but upside down. Because broiler tends to cook food very quickly, you will only need to cook the steak for just 4-5 minutes per side. In a large pot of boiling salted water, cook potatoes until parboiled for 10-12 minutes; drain well. 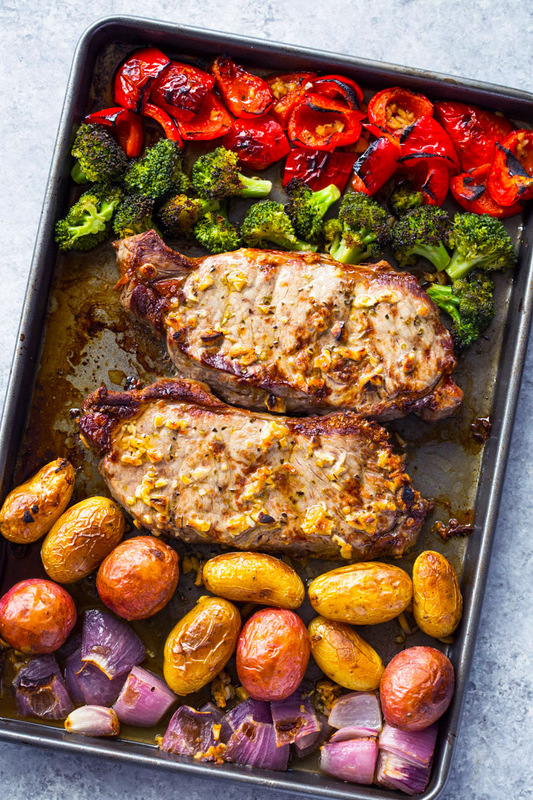 Arrange steak, potatoes, broccoli, bell pepper, and onion on a large sheet pan. In a small bowl, whisk the garlic, olive oil, Italian seasoning and salt + pepper. Brush the mixture on the steak and veggies. 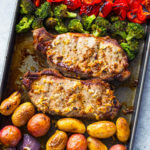 Place into the oven in the upper-center rack and broil until the steak is browned and charred at the edges and the veggies are lightly charred, about 4-5 minutes per side, flipping once, for medium doneness. *substitute small baby potatoes with regular potatoes cut into large chunks. Should I turn everything halfway through cooking? Yes, broil on one side for 5 minutes and then flip and broil another 4-5 on the other side.